Most pets are welcome in our park. Two dogs are included per site and prior approval is needed for additional dogs + a $10 fee per extra dog. Dogs must be kept on a 6 foot leash at all times (unless utilizing the dog park) and may not be left unattended outside. This a CA law and people found to be disobeying it will be subject to a $25 fine per offense plus we may call animal control on you and you may be asked to leave the park. Although we are a dog friendly park, please make other arrangements for your Akita, Chow, Doberman, German Shepherd, Husky, Pit Bull, Rottweiler, or any mixes of theses breeds. Other indoor pets are fine but note that ALL CATS should be kept in your RV unless harnessed or created when outside. 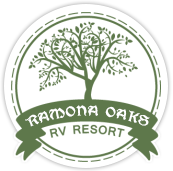 Ramona Oaks reserves the right to refuse service to anyone whose pet is not considered suitable for the serenity or security of the park. Please notify us in advance if you have a service animal so we may note this on your reservation. Additional deposits and/or cleaning fees may apply if your service animal soils or damages any area typical off limits to pets. Reservations cancelled within 48 hours of reservation date will result in a loss of a one night deposit. Reservations cancelled outside of 48 hours result in a $10 cancellation fee. Reservations cancelled within 7 days of reservation result in a loss of a one night deposit. Reservations cancelled outside of 7 days result in a $10 cancellation fee. All reservations require a one (1) night deposit on a Visa or Mastercard. Our staff will be contacting you for payment information as soon as possible. Until a deposit is made the Reservation is not complete and a site will not be held. Please note: your credit card will remain on file with us for the durations of your stay in case of any incidental damage caused by the guest(s) while on the RORV property.